Do you only generate enough money to get by? What if Money could work for You instead of You working for Money? Recording of a live 6 telecall series with Access Consciousness founder Gary Douglas. Recording of a live 6 telecall series with Access Consciousness founder Gary Douglas. What if Money could work for You instead of You working for Money? Have you decided that money is more valuable than you? Do you only generate enough money to get by? Have you made having money unattainable? What if you could generate obscene amounts of wealth easily and joyfully? Most programs about money deal with saving or investing; they do not address how to make money a reality in your life. 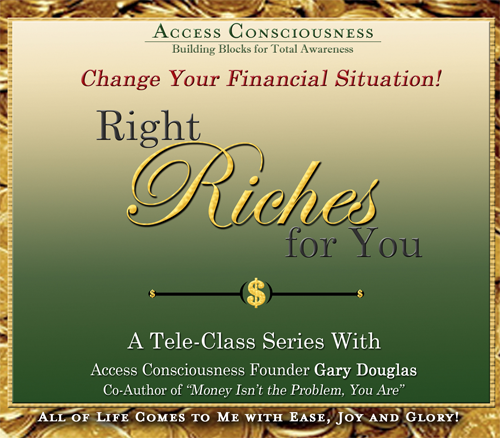 Right Riches for You contains a unique set of practical tools and energetic processes you can use to unlock the areas of your life where you limit the amount of money you can have and receive. These tools empower you to change your financial situation with ease and permanence. It's simply a choice. What are you choosing?